The 2014 Toyota Highlander is now available as either an 8 or 7 seat sport ute. Once again supersized, the new Highlander is perhaps the best place to start a family vehicle search. The 2014 Toyota Highlander was officially released this week. The all-new design’s major change is that it can now be configured for either 8-passenger or 7-pasenger seating. The rear third-row can now seat three across. That means it can transport a set of parents plus one full line of hockey players plus a goalie. Or more likely, you can transport your two or three kids plus three neighbor kids to whatever event you are headed to. As an owner of a Toyota Highlander this author can attest to the vehicle’s excellent suitability to a family’s needs. Highlanders don’t traditionally have the most dynamic styling or the sportiest handling. What they do best is get families around reliably, safely, and comfortably. This new Highlander looks to continue that tradition. There are technically three engine choices. There is the 3.5 liter V6, the new hybrid drive with a V6 and electric accompaniment we will write about separately, and there is an “imaginary” 2.7 liter four-cylinder that will be as rare as a baby pigeon in dealer showrooms. The vast majority of Highlanders will come with the 3.6 liter V6 which has 270 horsepower. It will be coupled with a 6-speed transmission. Almost all the Highlanders north of the Mason-Dixon Line will be AWD, but Toyota will make 2WD versions for some markets. 2WD means front wheel drive in a Highlander. Toyota has not gotten the official EPA estimates for mileage yet, but it is preparing the public for no improvement over previous models. Toyota is projecting the V6, AWD version will get 18 city and 24 highway, with a combined number of 20 MPG. That is a 1 MPG combined improvement overall compared to the outgoing 2013, and also the first generation that ended in 2007. Interestingly, the two-wheel drive, 4-cylinder version is projected to get almost exactly the same mileage as the 2WD 6-cylinder model, with both getting 25 MPG highway. So what is the point? If it is any comfort actual users on FuelEconomy.gov do report that the Highlander does get the promised fuel numbers in actual use. It should be noted that this V6 fuel economy is almost the same as the Hyundai Sante Fe Sport with a 2.0 liter turbo which gets a 19/24/21 MPG rating. Trying to find a smaller engine to get better MPG in an 8-passenger vehicle is not worth it. If that is your priority, look to the Hybrid which gets 28 MPG all the time. However, it costs dramatically more money. The fuel economy of the Highlander has barely budged in 7 years. One reason the new vehicle is not better in terms of fuel economy than the first generation Highlander is that Toyota has super-sized the vehicle now twice. The original Highlander is about the size of the current RAV 4. The new design is supposed to convey strength. We won’t argue the point. The front grill does look a bit like the spindle grill design on the new Lexus Line. It is quite pronounced and the front of the hood is almost completely flat. The headlights are thinner now and underneath is a large piece of body colored trim that leads down to the bumpers. Below are fog lights and under those LEDs on the Limited. The Highlander Limited now can come with the Panoramic Moonroof that most vehicles now offer. Others can have the standard moonroof. The wheels are 18 inch on the LE, LE Plus, and XLE. On the Limited they are 19 inch with low profile 55 inch rubber. On the RAV 4 the up-sized wheels make the ride too firm and spoil the Limited in our opinion. Hopefully this will not be the case on the Highlander, but we will report after we drive it. The full-sized spare is gone now and replaced with a temporary unit. In these times of hard choices for fuel economy perhaps we should be thankful there is any spare at all. The overall look of the 2014 Highlander is handsome, but not at all exciting. The infotainment system varies by trim level in the Highlander. We could go ahead and copy all the trim levels and the choices, but the truth is the dealerships are sent vehicles with the packages best for that zip code region. We caution buyers not to fall in love with a specific trim level based on the using the on-line configurator. Rather, look at what is available, and then call the dealerships in your area to see how the vehicles are actually coming in. Let’s not pretend that a lot of people (or anyone) orders a Highlander. Further muddying the waters with regard to infotainment on Toyotas is that the company uses the name Entune too much. It used to mean that the car had the top trim navigation and telematics (like On-Star) system. Now it means almost nothing as far as we can tell. One can get an “Entune” system with basically a stereo, or it can be the “Entune” system that allows one to talk to a person live to get help and directions. Let the dealership guide you at this point. Be sure you know exactly what you are getting. At the XLE and Limited trim level navigation is included. The limited gets JBL Audio. Starting with this new generation there will be four trim levels for the Highlander. LE is the bare bones vehicle. With the “imaginary” 4-cylinder and in 2WD, Toyota can advertise this Highlander as “Starting under $30,000.” Don’t be fooled. The “real” Highlanders start with LE Plus trim. At that level the drier seat becomes power adjustable and the trim starts to look more contemporary. All Highlanders have Bluetooth, so now worries there. XLE and Limited models can come equipped with all the goodies family buyers want depending upon packages. 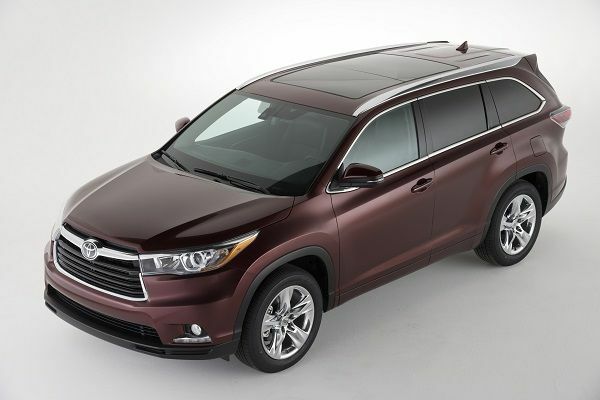 The new 2014 Toyota Highlander will continue to be a popular choice. However, the competition is now much closer to the Highlander. The new Nissan Pathfinder and the current Mazda CX-9 are both getting rave reviews. If shopping by the pound the Ford, Chevy and Dodge options are also hard to ignore. Even loyal Toyota fans will have to cross shop the Highlander now. Not an inspiring new design. That's for sure. Toyota needs to up its design game to keep customers interested in its products. The 2014 is a great improvement and looks much more interesting, inside and out. Reportedly much quieter and better handling, as well. I will be one of the first to buy one, probably in the XLE level (I don't want 19 inch wheels in the Limited). The 2009 model I have is the best vehicle I've owned in my 43 years of driving. Brad, thank you for backing up my feelings about these low profile, large diameter wheels on family cars. A loaded XLE is the sweet spot for the Highlander for sure. I think if more of us point out the negative aspects of the ride caused by these "sporty" looking tires maybe someday the automakers will wake up and stop the madness. My 2007 Highlander is the vehicle that best did its job of all the cars I've owned. I have the 16 inch rims and every time I hit a monster pothole (which is daily) I am glad I did not get the larger ones with the low profile rubber. Seems like old highlander owners aren't too thrilled about the new styling but myself as a will be new highlander buyer think it's a dramatic improvement. The looks outside and inside plus the additonal seating is what attracted me to the 2014 highlander. The previous models were too small and outdated looking, I think toyota did well with attracting potentil new buyers as those whohave older models are more likely to hold on to them anyways or until they get used to th enew styling. I too think the XLE is the sweet spot, the 8 seat potential sets this car apart from the competition and gives a real alternative to minvans. We value your opinion WW, but here are a few things we reported on about Toyota over the past year not based on opinions: Again the leader in quality according to J.D. Power not just for Luxury brands (Lexus) but also mainstream brands (Toyota) - Top selling automaker on Earth. Top Retail automaker in America. Winner of numerous green car awards - none of them for the Prius, Sold more green cars in America than all competitors combined, 12 hybrid models for sale in US market, More than any other brand. 2 EVs for sale in US markets, more than any other brand, Trucks rated highest in resale value, I could keep going, but my hands are getting tired. then how come my 2003 RAV4 and 2006RAV4 had nothing but PROBLEMS and I take care of them very well ! I was going to ask you why you were so down on Toyota. I'm sorry you had that experience. I had a 2003 Accord V6 and the trans failed at 57K miles. I had a Subaru 2.5 GT and the engine went at 11K miles (broken rod). I can relate to how an individual bad experience sours one on a particular brand. However, I thought both companies treated me fairly. Feel free to tell us more. toyota owners know about all the class action lawsuits against toyota cause toyota won't own up to its constant bad engineering. the transmission on the 2002/3 RAV4 had major issues and it took a class action lawsuit to make them own up to it. the famous toyota crisis a few years ago with cars out of control was denied by toyota until they came out with a fix. I have owned a boatload of toyotas since the early 80's my observations over the past 5 years have taught me that they are not the same company they used to be. you need to do a lot of research on toyotas problems and the facts are out there but it takes research. toyota has had a lot of very low rated vehicles in consumer reports the past few years. some with horrible ratings. their long term reliability is terrible in the past 10 years, I used to have corollas go 175,000 miles but I don't think my 2003 and 2006 RAV4's would go nearly that much without a lot of expensive work. I have has TWO RAV4's being long term junk. that is too much in my book and other high mileage RAV4 owners have similar experiences.